Sundayers bring a touch of spring sunshine – but aren’t we ready for full on summer NOW please! The sun came out today, just for a little while but it created a yearning for proper summer. This is probably reflected in this weeks all European, indeed all Jamendo mix. Just for a change I’ve included a couple of tracks from each of three artists, two of whom have brand new albums for us. The Sundayers have been producing this musical explosion since 2005. The result is a powerful brass section, solid percussion and drums, warm female vocals and attitude, lots of great attitude. 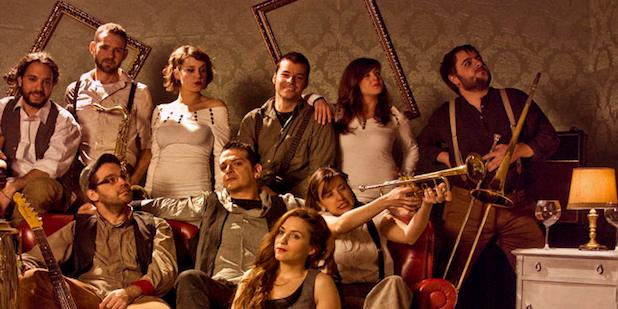 With 10 members, this Spanish band has carved out a niche in its own right within the Spanish reggae and ska scene. After releasing two albums, performing dozens of shows across Spain, they have created a creative and unique show that is hard to forget. This, and countless awards, has allowed them to open borders, such as that of Germany, where they have enjoyed a great success in last summer’s tour. “Impulsos” are the passion what led us to create and polish every song you can listen right now. Those who have made us go crazy for two years giving flavor to each chord. Those who have pushed us to share these letters. Those who have brought us incredible moments in our rehearsals and the certainty that this project can go on. Those who have turned upside down us and made us imagine and dream. And at the end, to turn this dream into a reality. Right now they are on a new 2013 tour. The first track on the most recent album. It’s that enticing mix of sounds and a language that I don’t know well enough to be distracted by the words, which, in this case, form another dimension against which the instruments play. At last, a new album from one of my favourite artists on Jamendo – which really is saying something. Grace has been putting out wonderful hypnotic albums for almost exactly the time that Suffolk’n’Cool has been running. Her first album Peak~ was released in 2006. It’s still available from Jamendo. The latest, Spring Souls was released last week and marks a return to a more acoustic sound and full of interest, some fascinating rhythms and of course, all the “grace” you’d expect from Grace Valhalla. She has compiled a video of clips from the many many of the videos in which people have used her music. All of her albums can be downloaded free of charge from her home page on Jamendo. A second track from SnC 367 openers Sundayers.